by Harold E. Raugh, Jr.
German Field Marshal Erwin Rommel, renowned as “the Desert Fox,” was a master of mobility and maneuver warfare during the see-saw North African campaign of World War II. He was successful because of his dynamic leadership abilities, technical and tactical competence, ability to understand and properly use the terrain, professionalism and perseverance, and ardent desire to be as far forward as possible to best “see” the battlefield and control military operations. 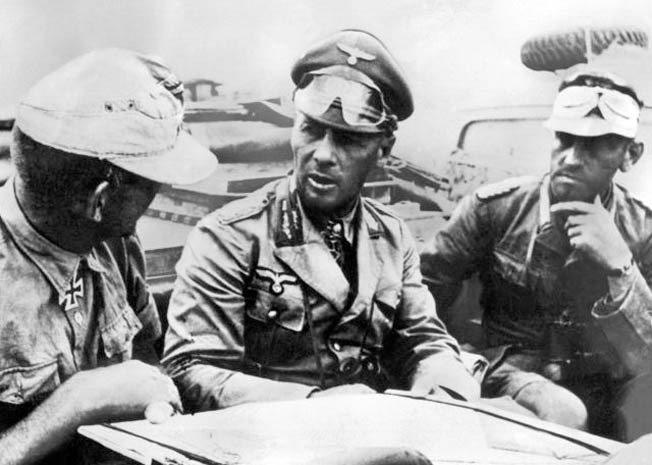 There was another more significant and less known factor that permitted Rommel to seemingly always be “at the right place at the right time.” Rommel frequently received detailed and accurate information on Allied troop dispositions, tactical innovations, logistical concerns, and future plans from what he called “die gute Quelle”—“the Good Source.” The “Good Source” of Erwin Rommel’s high-grade intelligence was, ironically and surprisingly, the U.S. Military Attaché to Egypt, Major (later Colonel) Bonner Fellers, U.S. Army. Fellers, born in 1896, graduated from West Point in November 1918. He was commissioned a second lieutenant in the Coast Artillery Corps of the U.S. Army. During the following two decades, Fellers’ military assignments were typical of those of a junior officer: various military courses and schools, instructor duty at West Point, and troop and staff duty in the Philippines. Fellers did not have to wait long after arriving in Cairo to begin his attaché duties and observe British military operations. The British were apparently eager to solicit American support and engender a feeling of cooperation between the armies of the two nations. Accordingly, British Lt. Gen. (later Field Marshal Lord) Henry Maitland Wilson, commanding British troops in Egypt, invited Fellers to accompany him to observe “Training Exercise No. 1” in the Western Desert during November 25-26, 1940. Fellers had unrestricted access to the exercise area and all participants. After returning to Cairo from this exercise—which, unknown to Fellers and all but a handful of senior British commanders and staff officers, was in fact a rehearsal for Operation Compass—Fellers wrote an interesting and detailed report on his observations and experiences. Before making a radio transmission, Fellers encoded this and all subsequent messages in a new, supposedly impregnable top-secret code called “Black,” from the color of its binding. As the intensity of military operations in North Africa increased, so did the frequency of Fellers’ reports to Washington, complete with details of British troop dispositions and intentions. It took the Germans about two hours to identify Fellers’ messages, decode them, and translate them into German. After being encrypted in a German code, these messages were then transmitted directly to North Africa. As a result, by the beginning of 1942, every morning at breakfast, Erwin Rommel was said to have received “a concise appreciation of his opponent’s plans, location of units, strength, and morale.” Such a daily diet of detailed and accurate enemy intelligence was veritably unprecedented. Fellers continued to unwittingly serve as Rommel’s eyes and ears in the desert. A second set of ears was provided by German Captain Alfred Seebohm’s 3rd Radio Intercept Company. Seebohm’s unit was highly proficient at intercepting British and Allied signals intelligence, of which “the Good Source” was probably the most significant.